The Kwando is, without doubt, the best children’s kayak in the world. We have created a high-performance recreational kayak that a child can paddle – properly. It has everything that we, as adults, expect from a kayak in terms of speed, performance, agility, manoeuvrability and responsiveness. 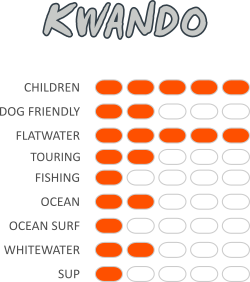 The Kwando can handle a variety of activities from flatwater paddling to river tripping to give your child a true taste for the sport of paddling. From very young to pre-teen, our Kwando kayak will be your child’s adventure companion until they grow out of it and into one of our other models, like the Tarka. The rear Tankwell has enough space for a small canine companion. If the dog prefers to sit, rather than to lie down, line the Tankwell with a foam mat to prevent their paws from slipping. The Kwando cuts through water like a hot knife through butter. 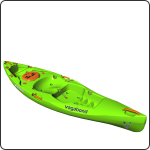 With this kayak, children feel like they’re really paddling because they can move forward without exerting themselves. They too enjoy being able to move forward with speed. For parents, this means that you can paddle at an easy pace and you won’t be waiting-waiting-waiting for your child. The Kwando makes paddling good fun for parents and children. While the deck of the Kwando has not been kitted with our angling features, kayak fishing is definitely an activity that can be enjoyed from this kayak. Use the Tankwell and 8″ Screw Hatch to stow gear, and Stand-up Platform to hold tackle between your legs. With the Kwando, visiting the beach becomes a whole lot more exciting than building sand castles and getting dug in up to your chin. Now your child can paddle on the sea too. Build up confidence and the maritime skills of reading currents, swell and waves gradually by starting out on calm seas. It goes without saying to always keep to swimming beaches where there are lifeguards on duty and to adhere to their instructions at all times. The Kwando has not been designed to do cutbacks and ride tubes but it will happily go out through the breakers and back in to shore. If you want to get into surf kayaking, check out our Dumbi kayak. For an introduction to rivers and whitewater kayaking for children, you don’t get better than the Tarka. Flowing water and small rapids are child’s play for this versatile kayaks and should serve to whet your child’s appetite for more. Use the 8″ Screw Hatches and Tankwell to secure gear for overnight trips. If you plan to do trips and your older child has the skills for bigger water and rapids, consider one of our whitewater kayaks like the Usutu sit-on-top or Pungwe creek boat. While we don’t recommend paddling the Kwando from a standing position, use the Stand-up Platform to stand, stretch your legs and enjoy a height-above-water view to check out your surroundings, while you’re out on the water.